Bird Houses can be natural cedar wood that are made to last a long time, or decorative with paint. Bluebird and Wren bird houses are most common and Bird houses can be hung or pole mounted. Wren bird houses are design with smaller entrance holes sizes just for them which stops larger birds from taking their homes. Bluebird Houses should be an all natural cedar wood birdhouse for long life. Their entrance holes can have an extra thick guard to block predators. 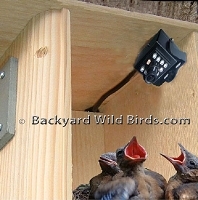 When needed use a bird house pole with a birdhouse to bring bluebirds and other wild birds into your backyard. Bird house poles can also have pole baffles to stop squirrels, raccoons and predators from climbing the pole. Give me shelter from the storm! 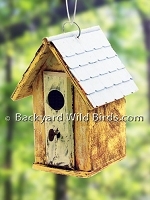 Ultimate Bluebird Birdhouse uses Red Cedar for a long life Bluebird Cedar Birdhouse. Both Bluebird birdhouse sides open for viewing, has metal front predator guard and elevated bed. 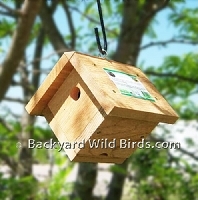 Standard wood Audubon Bird House made from durable Cedar for a long lasting wood bird house. Birdbirds will love you for this great birdhouse! Audubon Wood Wren Birdhouse that shows its hand crafted appeal of an Audubon natural wood birdhouse. Great Birdhouse Pole kit with a squirrel baffle predator protector below. Pole is 68" above ground and comes with an adaptor plate mount so it is ready to add the bird house or bird feeder of your choice. Bird House Pole is an excellent 5 foot pole to mount your bird house on. It includes a stake ground socket, bird pole and bird house mounting plate. Bird House S Pole Mount is a Birdhouse Pole kit . 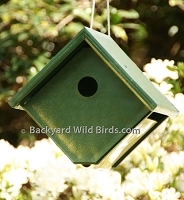 Comes with an adaptor plate mount so it is ready to add a wood bird house or bird feeder of your choice. Approx. 82" tall above ground. Bird House Baffle Pole is a protected pole to mount your wood birdhouse on. It includes a stake ground socket, bird pole, cone squirrel baffle and bird house mounting plate. 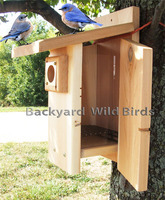 Bluebird Birdhouse with Viewing Top Sky Light and predator guard using cedar makes a long lasting wood birdhouse. The White Church Bird House with red doors and black roof has a small town charm. 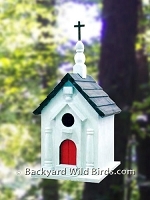 The White Church Birdhouse an authentic look and gives the birds a nice place to setup for their young hatchlings. Forrest Hidden Cottage Birdhouse is a cute get away cottage. 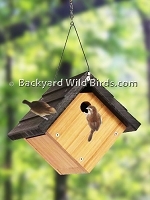 This hanging Wren House has 1 1/4" opening designed to accommodate House Wrens. This charming little green and white Butterfly Cottage features a hand painted floral design. Grayton Beach Bird House is both decorative and functional bird house. This Grayton Beach Bird House is a unique and charming hand crafted bird house design. 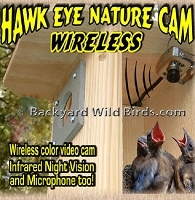 Hawk Eye HD Camera is a miniature color video wild life spy camera. This Hawk Eye Nature Cam Camera is miniature High Definition, 700 tvl, color video camera, with night vision, and microphone. The Hawk Eye Wireless Camera is the perfect solution for our customers who simply can't get the audio-video (AV) cable on our wired Hawk Eye Nature Cam into the house. The camera has infrared night vision, built-in microphone, a 70-degree, wide angle, variable focus lens, and sun hood. Key Hole Birdhouse is a decorative wooden bird house. 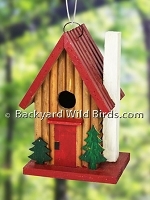 Key Hole Birdhouse has a shingled roof and a retro door with key and hole. The shingled roof adds style to this beautiful decorative design. All natural Cedar Log Cabin Wren House makes a very nice Wren Birdhouse. This Town and Country style Cedar Log Cabin House is made from long lasting rough Red Cedar. Mountain Cabin Birdhouse makes a very nice Wren Birdhouse. Stylish yet functional birdhouse that birds love! Adds charm to your backyard. Built in hanging system, bird safe, lead-free paint, and easy clean out access. Bird Nest Wreath is a nesting material wreath and ornamental wreath all in one. Have an attractive ornament and help the birds out too with their nest building. 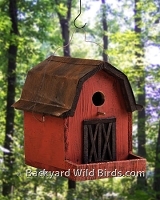 Red Barn Birdhouse is a functional bird house with a metal roof. The Red Barn Birdhouse roof gives nice protection from the weather with a rustic authentic look. 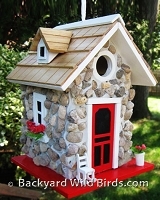 River Stone Cottage Birdhouse is a quaint styled Bird House which features river stone walls and pine shingled roof. 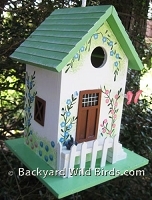 The birdhouse also has a window box and flower pot with bright red flowers. 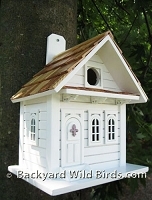 This White Cottage Birdhouse is a Shotgun Cottage Birdhouse in white with lavender Fleur De Lis on front door. Nice decorative bird house for songbirds. Window Nest Box lets you view the inside of a birdhouse to watch birds build nests, hatch and care for their young. 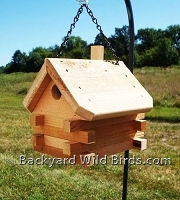 The Woodpecker Bird House is natures best all natural cedar wood birdhouse. The house comes with shavings because normally these birds do not bring anything but feathers to the nest and so they think they have made their home. This bird house is designed with a 2 in. entrance hole and a hinged roof. Wren Bird House is an all natural Cedar Wren Bird house. 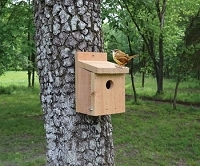 It is a traditional Wren bird house with the dimensions that they find attractive. 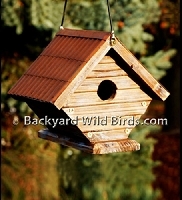 Wren Rustic Metal Roof Birdhouse that shows its rustic appeal with a natural rustic roof and wood bird house. Charming and functional with a rustic looking tin roof with an overhang roof that protects entry hole from the elements.